A showcase of luxury Beijing properties aimed at the country's most wealthy inhabitants has so far failed to draw the crowds organizers hoped for. The four-day Beijing International Top Property and Luxury Show kicked off on Thursday at the Beijing World Trade Center, the capital's financial hub and home to a mall selling luxury goods. The show featured high-end homes with price tags of at least 30,000 yuan ($4,777) per sq m.
But some among the sparse crowd were not impressed. "These houses are too expensive not only for working people, but also for the middle class," said Lily Wu, a 40-year-old visiting the show with her German husband. "And their locations are usually in the suburbs. I think they would not be a suitable and smart choice for most Chinese." Many homes featured at the show were 10-million-yuan luxury houses complete with the world's leading brands in household goods, cars, jewelry, pianos, wines and other items, said show organizers. The most expensive property was the 50,000-yuan-per-sq-m Legacy Home located near Olympic Forest Park in Chaoyang district. Its neighbors include last year's Olympic icons, the Bird's Nest stadium and Water Cube. Villas there cost more than 20 million yuan. But if organizers were hoping for a crush of super-rich people in the grand exhibition hall they may have been disappointed. Most were property agents hoping to make a sale. Some pointed to the stiff admission fee as one of the reasons why so few people visited the event. Usually, people gain entry to property exhibitions in Beijing for around 5 yuan. 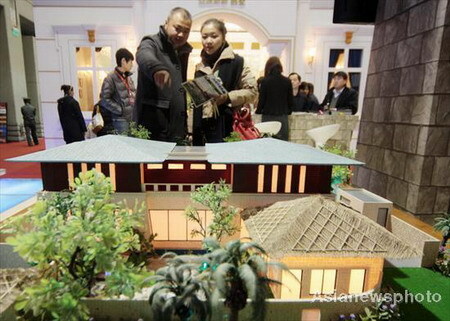 The Beijing International Top Property and Luxury Show was charging a 100-yuan entrance fee. The ticket price was slashed to 50 yuan for the second day. Ticketing agents refused to link the price cut to the show's slow start. A Hurun Report on China's wealthiest people said there are 143,000 multimillionaires and 8,800 billionaires in Beijing. The report said China has 825,000 individuals worth more than 10 million yuan and 51,000 individuals with more than 100 million yuan. Despite the lukewarm reception during the show's opening days, high-end property developers remain optimistic. Tristan Marshall, director of the Kinetic Group from Australia, was among several overseas developers promoting homes in their home countries. Others came from countries such as the US and Malaysia. "We have 50 houses here for Chinese customers and 22 of the 50 have been sold so far," Marshall said. Dong Zouji, director of the Ministry of Land and Resources' planning department, said prices of ordinary commercial property had gained value too fast in China.